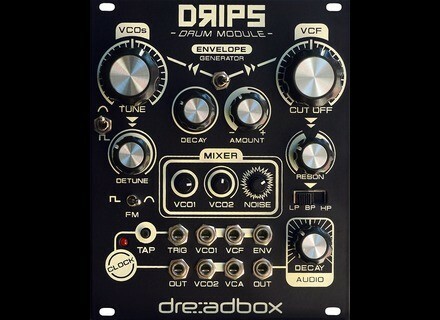 Drips, Generator module for modular synthesizer from Dreadbox. Dreadbox is at the Musikmesse to present Drips, a Eurorack format modular drum machine. 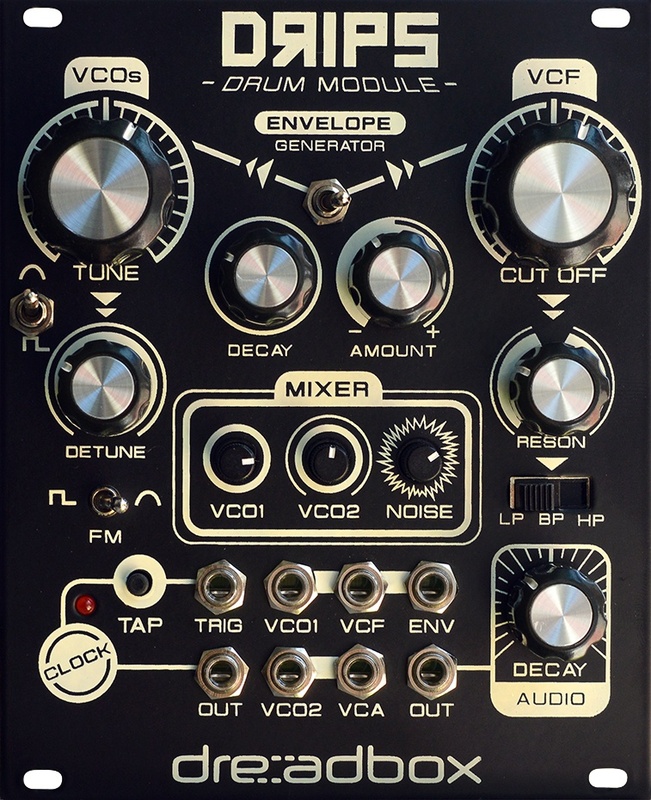 Drips features two VCOs, one VCF, a noise generator, a switchable hi/lo/band-pass filter with cut-off and resonance, an envelope generator, a decay and a detune knobs as well as a switch making it possible to choose from two different waveshapes for frequency modulation. A mix section is also available fro the two VCOs and the noise generator, as well as a patch section to allow linking the VCO, VCF, VCA, envelope, trigger and outputs to other modules. Plenty to create as far as percussive sounds are concerned. More details to follow at www.dreadbox-fx.com. [MUSIKMESSE][VIDEO] Nori Ubukata Theresyn Nori Ubukota introduces Theresyn, his very own original variation on the theme of the classic Theremin. [MUSIKMESSE] Sledge is the new black? At the Musikmesse, Studiologic presents a Black Edition of its Sledge 2 synthesizer. [MUSIKMESSE][VIDEO] Dasz Instruments Alex A tour and demonstration of Dasz Instruments' Alex digital synthesizer at Musikmesse 2016.